Alyce Ritti (left) and poet Camille-Yvette Welsch (right). Poems from Life, a collaboration between the Pennsylvania Center for the Book and Juniper Village at Brookline Senior Living, paired residents at Juniper with area poets. After getting to know the residents they’d been paired with, poets were tasked with telling that person’s story in a one-page poem. When it came time to choose which resident she’d like to be paired with, Welsch immediately recognized Ritti’s name. She was familiar with Ritti’s artistic work in collage and knew she wanted to write about her--this time, in a poem instead of an article. As a tribute to Ritti’s art, Welsch tried to incorporate the idea of collage into her poem. She blended her words with the words of Ritti and authors Ritti was fond of. Even the title of her poem, “Portrait of the Artist as an Old Woman,” is a nod to James Joyce. 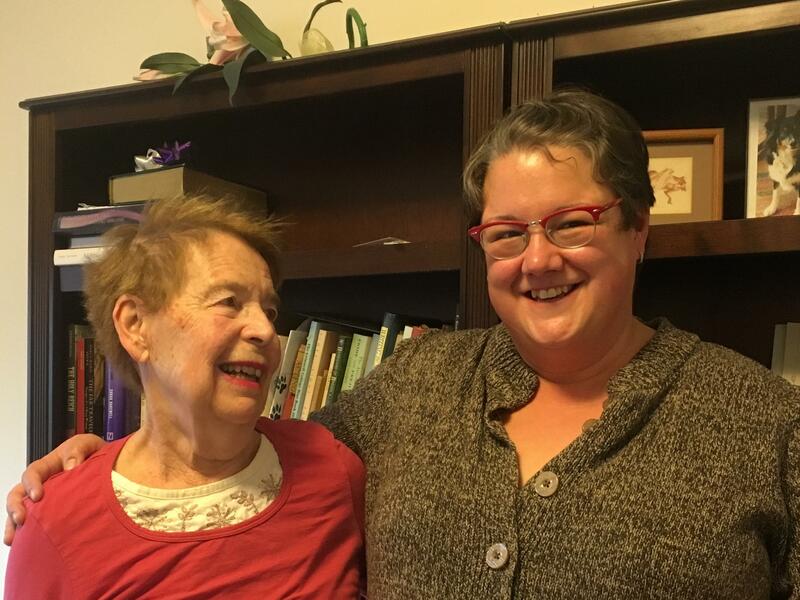 Katie Kensinger, senior director of community relations for Juniper Village at Brookline, came up with the idea for Poems from Life after reviewing information Juniper had collected about each resident’s life history. She knew she wanted to tell these people’s stories, but she wasn’t sure how. Ellysa Cahoy, assistant director of the Pennsylvania Center for the Book, suggested using poetry. Why? “Poetry has this amazing capacity to just capture in very few words something very large and emotional and impactful,” Cahoy explained. Nicole Miyashiro, editor at the Pennsylvania Center for the Book and a poet herself, suggested the project and used her connections in the poetry community to help Kensinger and Cahoy bring the project to life. On Tuesday, Juniper Village will host an event where poets share the poems they’ve written with the residents, their families, and members of the community. This is the event’s second year. The event is a celebration of the residents’ lives, and it’s an outgrowth of this collaboration--one that Kensinger says Juniper cherishes. And what do the residents think about Poems from Life? Ritti shared what touched her most about Welsch’s poem. You can hear these poems Tuesday, April 24, at 6:30 p.m. at Juniper Village on Cliffside Drive in State College. The event is free and open to the public. out, the Syrian queen, bobbing in her shuddersome circle. I begi(a)n in a heap of chaos, now this compressed scene. Remembrance of...No, no. In Search of Lost Time, if you please. those familiar songs and your curiosity, always there, like knowing.